by Alan Taylor. Hardbound, 560 pages, 6" 9". 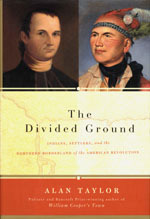 Here is the gripping account of how the "middle ground" between Indians and settlers became a "divided ground" uneasily shared by Americans and Canadians. Includes 48 illustrations and four maps.